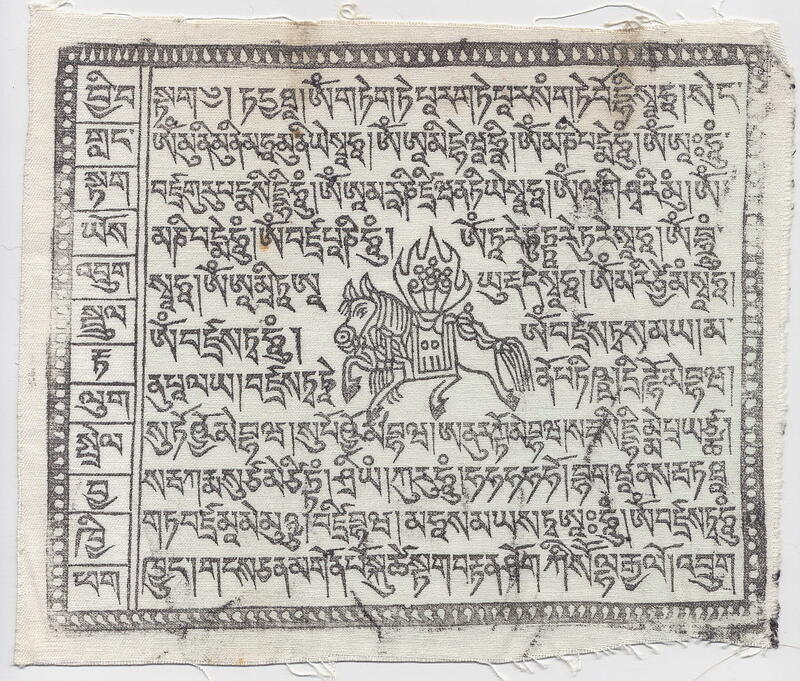 This page comprises several short Tibetan texts encoded in Unicode, that are intended to be used as a test for Unicode fonts that support the Tibetan block. In order to view the Tibetan text you must have an appropriate Unicode Tibetan font installed. Furthermore, proper rendering of Tibetan stacks may only occur if your operating system actively supports the Tibetan script. Microsoft Vista includes a Tibetan font (Microsoft Himalaya) and provides rendering support for Tibetan by means of its Uniscribe complex script rendering engine (USP10.dll). These are a few sample Tibetan songs and poems dating from the 7th through 17th centuries. They are written in pure Tibetan, and do not contain any complex Sanskrit stacks or unusual characters. The poems are all transcribed from Shaoshu Minzu Shige Gelü 少数民族诗歌格律 (Lhasa : Xizang Renmin Chubanshe 西藏人民出版社, 1986) chapters 2 and 3. This song was composed by a minister of King Srong-brtsan-sgam-po སྲོང་བཙན་སྒམ་པ (c.609-649) in about 641, and sung to the king's Chinese bride-to-be, Princess Wenchang of the Tang court. The song is a eulogy to King Srong-brtsan-sgam-po and his Tibetan kingdom. This is fragment of a poem describing a snowstorm by the famous Tibetan poet, Mi-la Ras-pa མི་ལ་རས་པ (1040-1123). This poem was written by the fifth Dalai Lama Ngag-dbang Blo-bzang rGya-mtsho ངག་དབང་བློ་བཟང་རྒྱ་མཚོ (1617-1682). This is the Tibetan translation of the Heart Sutra (Mahāprajñapāramitā Hṛdaya Sūtra) made by Vimalamitra and Rin-chen sde རིན་ཆེན་སྡེ. Although it contains a few characters used for Sanskrit transliteration, such as the a-chung vowel lengthener and the anusvara, there are no complex Sanskrit stacks. This is an example of a Wind Horse prayer flag. These are very common, and can be recognised by presence of a Wind Horse (རླུང་རྟ) in the centre, and the names or pictures of the four guardian animals (tiger, lion, garuda and dragon) at the four corners. This example additionally has the names of the twelve animals of the zodiac running down the left side. For further examples of Tibetan woodblock prints see my Tibetan Prints page, or take a look at Nik Douglas's excellent Tibetan Tantric Charms & Amulets (New York: Dover, 1978). As is typical with such prayer flags, the text comprises various mantras and invocations with complex Sanskrit stacks and unusual characters, in this example including two shorthand contractions on the last line. Dimensions : 18.6 x 15.3 cm. The following is the Tibetan translation of the Universal Declaration of Human Rights, but encoded using the PRC's standard for precomposed Tibetan. This standard uses a subset of the characters in the Tibetan block <0F00..0FFF> (all characters other than the subjoined consonants, vowel signs and other combining marks), together with precomposed stacks comprising one or more consonants with zero or more vowel signs. The most common 1,536 Tibetan stacks are encoded in the PUA on the BMP at <F300..F8FF>, and are known as Set A (藏文编码字符集扩充集A). Set B covering less common stacks is not yet fully defined, and will occupy part of the Supplementary Private Use Area-A on Plane 15. Tibetan written using this standard comprises a mixture of standard Tibetan letters, symbols and punctuation marks from the Tibetan block and precomposed complex stacks encoded in the PUA. Be warned that with most Unicode Tibetan fonts the following document will be mostly illegible, but Chris Fynn's Jomolhari font supports both standard and precomposed Tibetan, and will render the document correctly.